In 1988 the Nova Scotia Department of Lands and Forests published Forest/Wildlife GUIDELINES and STANDARDS for Nova Scotia that were designed to maintain or enhance fish and wildlife habitats in the forest environment. The guidelines were implemented on Crown lands and encouraged on private lands. The guidelines explained many of the topics (Forest Diversity, Edges and Wildlife Corridors, Special Management Zones near Watercourses, Cavity Trees, Snags and Downed Trees, Deer Wintering Areas, and Birds of Prey and Heron Colonies) that are explained also in Lessons Two and Three of this module. In 2002 some of the guidelines became law. This was at the urging of many in the forest industry to create fairness. Good corporate citizens followed the guidelines, but some other individuals gained an advantage by not. Under the Forest Act the Wildlife Habitat and Watercourse Protection Regulations make into law two main topics: (1) Legacy Clumps (Leaving islands of uncut trees within harvested areas, and (2) Special Management Zones (Leaving uncut trees along watercourses). Carl is having trouble keeping the attention of students during this lesson, as they get caught up in stories about the old days when game wardens chased deer poachers and not forest cutters. Harold, one of the class members, tells a story of when he was young and more foolish. He would carry a rifled slug in his boot during the grouse season, before the deer season opened. One day the game warden, Hughie MacIsaac, checked him for his license and asked to see his shotgun shells. Although Harold described how guilty he must have looked, Hughie did not ask him to remove his boot. At the beginning of the lesson Carl hands out a copy of the regulations. Dan Barr is considering a four-hectare harvest within his woodlot near Brandy Brook, so he is interested how the regulations will affect him. Most of the WH&WP Regulations appear in this lesson, but students with Internet connections can view the complete regulations at the link below.Take note, also, that the regulations may have been updated since this module was printed. A clearcut and many shelterwood cuts are severe site-altering disturbances. Understory plants, and other forest living organisms, are suddenly “homeless” and exposed to greater extremes of temperature and weather. The harvest removes many tree-dependent organisms such as lichens and invertebrates. The term “Legacy” refers to keeping a remnant or sample of the original species that lived in the stand before the harvest. Legacy clumps of uncut trees are left within the harvest area. As trees regenerate in the harvested area, there is an expectation that descendents of species with the same genetics that lived in this forest 30 or 40 years ago will survive in the clump and repopulate into the surrounding forest. As explained in Lesson One, the conservation of local biodiversity maintains forest adaptability and resiliency. Lesson Two also explained the importance of having cavity trees and snags as a component of wildlife habitat. 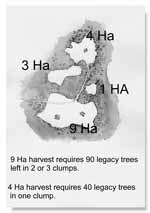 The legacy clumps are intended to provide present and future cavity trees, snags, and downed woody debris. Taller trees, still standing within the clump as the surrounding area re-establishes, provide vertical diversity. 4 (1) On any harvest site comprising an area greater than 3 hectares of forest land, the forestry operator shall ensure that at least 10 living, or partially living, trees are left standing for each hectare of forest land cut. (v) there shall be no harvesting of trees within any clump. (3) Trees required to be left standing pursuant to subsection (1) shall not be removed before the next harvest. (4) A forestry operator shall ensure that levels of snags and coarse woody debris on all harvested sites are similar to natural patterns to the fullest extent possible. So what does this mean? Unfortunately for the average person, when regulations are written they must be done so in precise language to withstand arguments and scrutinizing in a justice system. The following comments and illustrations are hoped to offer clarifications. If a harvest is greater than 3 hectares, then 10 trees per hectare must be left in a clump within the harvest area. For example if Dan makes a 4-hectare harvest, he is required to leave one clump with 40 trees. Trees must be alive or partly living. Dead trees do not count. The trees in the clump must be representative of the tree species being cut. This subsection prevents a contractor from leaving a clump of tamarack or aspen (or less commercially valuable trees) while taking surrounding spruce. If resident wildlife was adapted to a forest of spruce, tamarack, and aspen, then a legacy of all these trees should be left. Law enforcement would result for blatant misrepresentation of stand tree species in the clumps. There would be tolerance for some deviation from exact percentages when an honest effort is made. The legacy trees must be average size or larger than the average size of the harvested stand. This prevents intentionally choosing clump sites with small trees, as was done when following the previous 1988 guidelines. The woodlot owner has the option of selecting legacy clump sites that might have a few large yellow birch or other long-lived tree species that would provide good cavity tree anchors within the clump. The clump might also be situated around a vernal pool, thus shading this springtime pool. There must be at least one clump for each 8 hectares harvested. Clumps must have a minimum of 30 trees or a minimum of 80 trees dependant on the number of clumps left per 8-hectare area. An 8-hectare harvest would require one clump of 80 trees or two clumps with no clump having less than 30 trees. A 24-hectare harvest site would require 240 trees in total, and could have 3 clumps with 80 trees each, 8 clumps with 30 trees each, or some combination in between. Some biologists think that biodiversity, or survival of more organisms into the next rotation, is better preserved by a few large clumps instead of several smaller legacy clumps. Also larger clumps will have more wind firmness. There are rules on distances where clumps are separated in relation to other clumps and the uncut forest edge. Clumps must have a distance of more than 20 metres and no more than 200 metres from other clumps or the unharvested edge of the cut. The idea is to ensure a somewhat even distribution of the clumps over the harvest site. Once a clump is established, the legacy trees cannot be harvested. Even in the event of blow down the trees cannot be taken. They can be regarded as the woodlot owner’s gift to wildlife and to the future forest. The fallen tree will provide valuable fallen logs. While the regulations do not stipulate a shape for the clumps, round shapes likely will better withstand blow down by wind. There is a provision to leave Snags and Coarse Woody Debris over the harvest site. For most harvest operations and especially in central regions affected by Hurricane Juan in 2003 the quantity of standing dead and fallen coarse woody debris is not an issue. It is more an issue where full tree harvest occurs and the whole tree is taken to roadside. Sections 5 to 9 pertain to Special Management Zones (SMZ) along watercourses. "Watercourse" means the bed and shore of a river, stream, lake, creek, pond, marsh, estuary or salt-water body that contains water for at least part of each year. For the purpose of this watercourse definition, marshes are defined as an area of permanent or slow moving water that is partly or entirely vegetated with aquatic plants. By this definition, bogs or meadows are not included. On Crown lands Carl when reviewing harvest plans requires a forested SMZ around some bogs and at the upland edge of Fens (grassy wetlands) that border streams since he believes they add to the habitat mix, in particular providing forested travel corridors. The 1988 Guidelines advocated SMZ for these wetlands and Natural Resources by policy still requires them on Crown lands. Woodlot owners are encouraged to also follow this practice for extra habitat and water protection. 5 For the purposes of Sections 6 and 7, the average width of a watercourse shall be determined by measuring the width of the bed of the watercourse at 10 approximately equidistant locations extending along the entire portion of the watercourse situated within or adjacent to the forest land where a forestry operation is carried on, and taking the average of the measurements. 6 (1) Where the average width of a watercourse situated on or adjacent to forest land on which a forestry operation is carried on is equal to or greater than 50 cm, a forestry operator shall establish or ensure the establishment of a special management zone of at least 20 m in width along all boundaries of the watercourse. (2) Where the land on which a special management zone is established pursuant to subsection (1) has an average slope within 20 m of a watercourse boundary of greater than 20%, the forestry operator shall increase the width of the special management zone by 1 m for each additional 2% of slope to a maximum of 60 m in width. Where the water flow has scoured the stream bottom is not hard to determine. Sometimes a stream will flood its banks. The floodplain beside a stream where flood tolerant grasses and shrubs might grow is not considered part of the streambed. Banks of steams are often undercut by the stream and this “hidden” distance of bed under the bank must also be measured. Brook trout often hide in these crevices, which are important stream habitat. A mink will check out all these over hanging streambanks as it hunts along the stream. The streambed width measurement is the average of ten equidistant measurements. The calculated average of all measurements determines whether the width is above or below 50 cm along the whole length of the watercourse adjacent to the planned harvest. Even if the width of the streambed is less than 50 cm at a few measurement points the SMZ must be applied between the stream and the whole harvest site. In Dan Barr’s example along Brandy Brook, Dan’s harvest will border the stream for 200 metres. Dan would try to make measurements at 10, 30, 50, 70, 90, 110, 130, 150, 170, 190 metres along the watercourse. He averages a streambed width of 1.4 metres, so will require a 20-metre or wider SMZ. For watercourses wider than 50 cm then a 20 metre Special Management Zone is necessary. The width of the SMZ can increase up to 60 metres where slopes are very steep. Professional Forest Technicians use a clinometer for determining stream bank slope. The technician stands next to the stream and sights 20 metres up the bank to an eye level point there. Some hand compasses have a pendulum. By sighting up the slope with the compass held on its edge, the degrees of slope can be calculated. If degrees are 9 or less then no additional SMZ width is required. (c) create an opening in the dominant tree canopy larger than 15 m at its greatest dimension. (4) Despite clause (3)(a), the operation of a vehicle for the purpose of watercourse crossings approved by the Department of Environment and Labour is permitted within a special management zone. Harvest of trees within the SMZ is permitted. Vehicles however are not permitted within 7 metres of the watercourse and only a partial harvest is permitted. No activity can occur that causes sediment being deposited in the watercourse. Within a SMZ a woodlot owner has the option to remove certain valuable sawlog trees or perhaps do a pre-merchantable or a merchantable thinning. A partial harvest is allowed within the SMZ but the basal area cannot be reduced more than 20 M2. Forest Technicians use a Wedge Prism for calculation of basal area. Information on measuring Basal Area is offered in the references. To ensure an even distribution of remaining trees, only single trees or small patches of trees can be taken. No opening can be created in the dominant canopy greater than 15 metres. The Department of Environment and Labour approval is required for stream crossings where vehicles must approach and cross a stream. It is encouraged when building roads across streams, keep the right of way narrow and do not create an opening in the dominant canopy more than 15 metres wide. 7 Where the average width of a watercourse situated on or adjacent to forest land on which a forestry operation is carried on is less than 50 cm, no forestry operator shall permit the use of, use or operate a vehicle for forestry operations within 5 m of the watercourse, except for the purpose of watercourse crossings approved by the Department of Environment and Labour. For watercourses that have an average width measurement less than 50 cm, then the harvest of trees are permitted. No vehicle can be operated within 5 metres of the watercourse. Understory and non-commercial vegetation should be disturbed as little as possible. Remember that deposition of sediment into the watercourse could result in a violation, so take care. No one likes regulation, but the WH&WP Regulations were made law for a good reason and do not place excessive hardship on woodlot owners. Woodlot ownership is a privilege and comes with responsibility. Non-compliance, whether intentional or unintentional, could result in fines or embarrassment. If there is any doubt or question, please consult with the staff at the Department of Natural Resources.